The Chicago Daily Tribune reports today on the "latest royal scandal," this time involving Archduchess Elisabeth of Austria and her husband, Prince Otto of Windisch-Graetz, and a French actress. Archduchess Elisabeth, the only child of the late Crown Prince Rudolf and Princess Stephanie of Belgium, married Prince Otto last year. According to the story, Prince Otto was "entertaining the actress" in his apartment, where he "was discovered" by his wife, who "shot and seriously wounded" the actress. The archduchess was about to shoot her husband, but "lost her courage just as at the critical moment." Prince Otto is said to be "quite a young man, with an "immensely wealthy" wife." The shooting took place at the palace in Prague, which belongs to Prince Otto's family. He had been "secretly paying assiduous attention" to the actress, who is well known to "half the gilded youth of Prague." The archduchess, who is 20 years old, learned of her husband's perfidy, when she was informed that he was "entertaining the actress" in his rooms. She reached for a "small gold mounted revolver," which Prince Otto had given to her for "her own protection at an hour of possible peril." She made her way to her husband's rooms, only to find his devoted valet standing guard outside the door. He remained obstinate to her entreaties to open the door. When he refused to budge, the archduchess pulled out her revolver, and began firing "wildly" at the valet, who then fled the ante-chamber. Elisabeth opened the door, and stood before the couple, "revolver in hand." Prince Otto moved toward his wife, who cried "beast," and shot the actress "in the breast." The woman fell to the floor as Otto "seized his wife" and struggled for the gun. She broke down and was led crying from the room. The actress was treated by a doctor. Her wound is serious, but not "mortal. She was taken to her apartment in Prague. "Strenuous efforts" were made to keep the news of the shooting out of the newspapers, but this proved to be impossible. Archduchess Elisabeth was "generally commended by the more straight laced members of high society." She will not face any legal charges for her "punishment of the actress." Archduchess Elisabeth is said to be Emperor Franz Josef's favorite granddaughter, was determined to marry the now 30-year-old Prince Otto. They met a "grand ball," and fell in love. The prince is a member of a very wealthy mediatized princely family, but at the time of their meeting, he was a "simple lieutenant in the First Regiment of Uhlans." 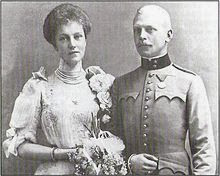 Franz Josef was opposed to the marriage, but the very "determined" Elisabeth told him that she would marry the "man she loved" or she would go to a convent and become a nun. The Emperor gave it, and the wedding was "celebrated in a magnificent way" after Archduchess Elisabeth renounced her right to the throne. Franz Josef gave the bride "securities valued at $1,000,000, a yearly allowance of $250,000, jewels worth $1,000,000, a golden dinner service, and several residences." Elisabeth was only 6 years old when her father, Crown Prince Rudolf, and his mistress, Marie Vetsera, were found dead at the imperial hunting lodge at Mayerling. She was considered one of the "most desirable catches" among Europe's eligible young women. She was once reported engaged to the young king of Spain, but she told her grandfather that she would not "marrying into any reigning house." Prince Otto is now "unanimously detested" now that his wickedness toward his wife" is public knowledge. Everyone believes that Elisabeth's love for him "will triumph," and they will reconcile. Wilhelm's plea for former Tsar! Do I have any readers in Monaco? Duchess of Saxe-Meiningen - Cancer?